Not all book awards are created equal. There are many awards and new ones spring up every year. Almost all awards require an entrance fee, per book and per category. If you enter every one available to you it can get quite expensive. Develop a strategic plan so you are purposeful in your award entry choices. Research the awards you may qualify for to see which ones will fit best into your marketing strategy. There are two types of book awards to consider – competitive awards and quality awards. Both are great opportunities for validation and PR opportunities and can be very helpful in getting the attention of bookstore buyers and librarians. 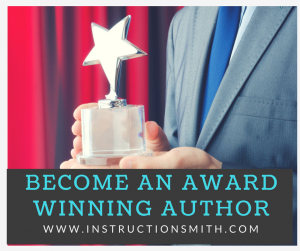 There are many awards that have submission processes that are open to books published by small independent presses or self-published authors. Some awards are even specifically for indie publishers and are not open to books published by the big publishing houses. This program is regarded as one of the highest national honors in independent and self-publishing. The Awards are unique in that entrants receive direct feedback on their submissions. The judging forms are returned to all publishers. Deadline for entries for the 30th Annual IBPA Benjamin Franklin Award™ Program is September 30, 2017. One of the oldest, most established independent book awards in operation, the Independent Publisher Book Awards (IPPYs) are well known and respected in the book industry. Entries are now being accepted for books released between January 1, 2016 and February 24, 2018, or with 2016-2018 copyrights. If you want to know more about the benefits click here. For complete guidelines and to fill out the online entry form click here. Be sure to fill in all applicable information. Email address is required as this is how you’ll be contacted and receive information about judging and results updates. Submission for more than one category is acceptable, but each requires a $75 fee per category. Early-bird deadlines in September and December are designed to encourage early entries (see schedule on order form). All entries must be posted online or postmarked by the final deadline of February 24, 2018. Researching awards, preparing entries, and tracking the awards entered can take a considerable time and effort commitment. This is a service that Professional Author Assistants can manage for busy authors as part of the Author’s Dream Team. Each award has its own set of requirements and attention to detail is very important to avoid disqualification. You’ll want to keep track of the awards you have entered and assure that the samples required are received. You can download an Excel spreadsheet to use to log award entries below. This is just one of many forms and checklists available through the Professional Author Assistant Training and Certification Program.